Today's ink is Robert Oster Rubine. Eventually I will get all of the Robert Oster inks reviewed, there are just a lot of them. This ink was provided to me by Vanness Pens for this review. 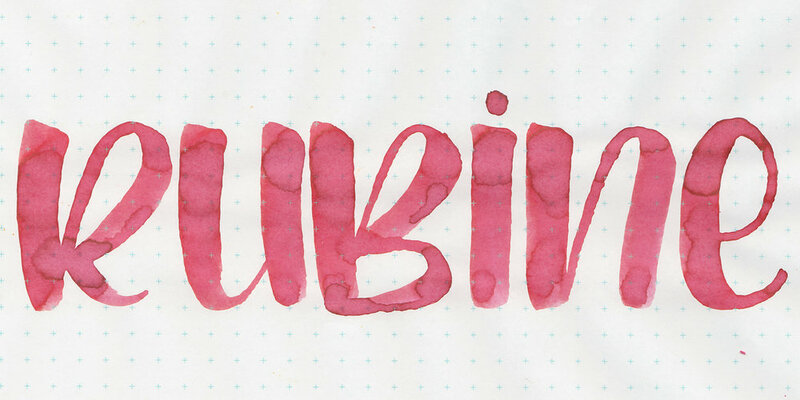 Rubine is a bright red with shading. There is a little bit of brown sheen in large swabs. On Sustainable Earth 20lb copy paper, there was just a little bit of feathering, but other than that the ink did really well. Ink swabs for comparison, left to right (top to bottom for mobile RSS): Robert Oster Clay Red, Robert Oster Rubine, and Robert Oster Royal Red. Click here to see the Robert Oster inks together. Rubine is the lightest of the three, then Royal Red, then Clay Red is the darkest. Sailor Jentle Grenade, Diamine Burgundy Royale, and Robert Oster Maroon 1789. Click here to see the red inks together. All three of these are a lot darker than Rubine, and have more of a maroon tone to them. I used a Pelikan M605 White Transparent, medium nib, on Tomoe River paper. It had an average flow. Overall, I think this is a nice red. It's not super saturated, but it's really well behaved, and has some nice shading and a little bit of sheen as well. Disclaimer: This ink was provided by Vanness Pens, for the purpose of this review. All photos and opinions are my own. There are no affiliate links on this page.